Home and business owners in the Chicago area understand the potential threat of mother nature. Of course, Chicago isn’t referred to as the windy city for no reason. In addition to strong winds, property owners may face water damage caused by issues outside of nature. Burst pipes can occur due to harsh, cold temperatures which cause frozen pipes and property flooding. Sewage can backup causing toxic water waste to spread in your home. As you can tell, there are times when disaster strikes and property owners are given little to no warning. 911 Restoration of Chicago is the water cleanup company that property owners can rely on when they need a Fresh Start. At 911 Restoration of Chicago, we know just how stressful needing water cleanup services can be. For this reason, our technicians have received the highest level of training and use state-of-the-art equipment when restoring your property. As soon as water damage is detected, property owners can call our office for emergency water cleanup services. The techs can be expected to arrive onsite within 45 minutes of your phone call and will begin by assessing the damage. During the damage assessment, our techs will be able to more clearly determine what cleanup services are needed, as well as what may need repairs. 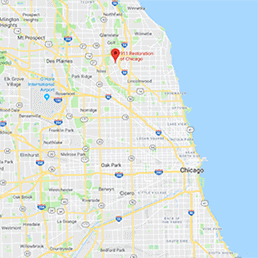 Chicago, Aurora and surrounding city property owners have access to a restoration company 24/7, 365 days per year with 911 Restoration. 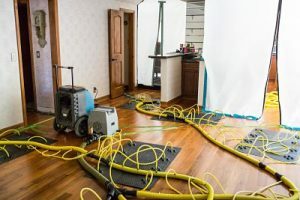 It’s important to know that there’s a restoration company in Chicago that property owners can trust when a disaster like a burst pipe strikes and leaves you with water damage. Choosing our technicians for your property repairs is not a decision we take lightly, and we treat each project as if it were our own. The damage will be inspected thoroughly and no stone will be left unturned. 911 Restoration restores your peace of mind, as well as your property. Get the water damage restoration services from a company you can rely on, call 911 Restoration of Chicago today. 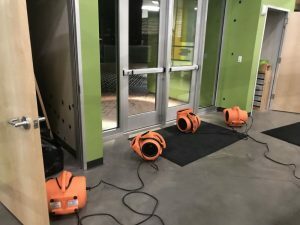 If you are experiencing water damage at a residential or commercial property, there is no such thing as being overly proactive. As soon as sitting water is noticed, it is important to call the experts at 911 Restoration of Chicago. We offer convenient office hours and are available all day, every day. So, when you are in search of emergency water removal, the highly trained IICRC technicians are ready to get you on the path to a Fresh Start. Whether you are a native of the Chicago area, or have newly moved here, you are probably well aware of the harsh winter temperatures. It is common for property owners to face water damage during these months due to frozen pipes. Being aware of the weather to come is step one in being proactive against water damage. Pipe freezing accidents tend to occur when the temperature is thirty degrees and below. When the pipe freezes it causes a lot of pressure inside and causes the burst. Pipe bursts are one of the leading causes in home flooding in the winter months, especially when there is no one around to turn the water off at the property. Many homeowners have had to deal with basement flooding because they were not overly proactive in preventing against frozen pipes. Keeping the heat turned on. By keeping the heat turned on in your property it can help keeps pipe from freezing and water damage. It is not necessary to keep the heat as high as you may leave it if you were home, but a good rule of thumb is to keep it set above fifty degrees Fahrenheit. Turn the faucets to drip. If you know that extremely cold weather is coming, you can turn the faucet enough to where it drips. By letting the faucet drip it helps relieve pressure in the system and avoid blockages. Leave the interior doors open. Most pipes are located in cabinets so when the temperature gets cooler, leave the cabinets open helps keep the pipes warm. Add heating tape. Heating tape works by supplying heat directly to pipes to keep them warm during cold months. Dealing with water damage alone is stressful. When water cleanup has not been handled properly, you can end up with far more property damage. Structural damage and mold infestations are two further problems that are common occurrences. 911 Restoration of Chicago’s techs have plenty of knowledge and experience handling water damage. They know the signs to look for with structural damage and how to properly inspect mold infestations. From mold inspection to mold removal to total property restoration, the experts at 911 Restoration have you covered. While we are initially hired to restore your property, we go the extra mile by ensuring your peace of mind is restored as well. The technicians will work with you from start until finish and want you to feel comfortable voice any questions or concerns that may arise. We know how stressed property owners feel during these times, and will do whatever necessary to help them feel at ease during the restoration process. Whether a pipe has burst leaving your Chicago home’s basement flooded or you need mold decontamination from severe water damage, contact 911 Restoration.